The Amazing Asimov Tackles His Most Fascinating Subject—Himself! 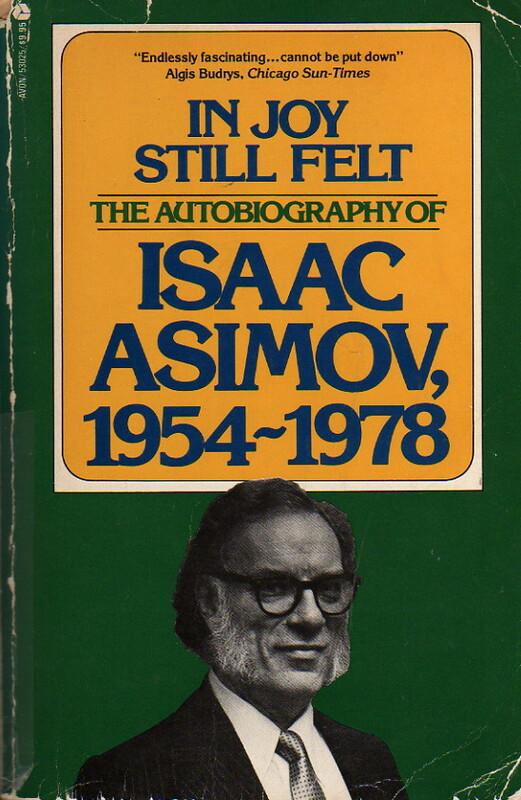 This is the second volume of Asimov’s formal autobiography (In Memory Yet Green was the first). Asimov had planned to write a third volume to be entitled The Scenes of Life, and maybe even a fourth, but never did—at least, not using the same narrative style. The Scenes of Life eventually came to be written on a different basis and published as I. Asimov: A Memoir. This book covers 1954 to 1978. Like In Memory Yet Green (q.v. ), Asimov treats himself with complete candor, admits his every fault (and virtue), and details his every failure (and success). We start with his fight with Boston University over his position—he had been writing non-fiction books on school time, and some of his superiors disapproved. It ends, neatly enough, nearly a quarter century later with Boston University’s promotion of Asimov to the rank of full Professor. Asimov is at this point at the peak of his writing career, well into his third hundred books, and the enormous success he never really believed he would become at the beginning. Along the way, we learn about his life, the failure of his first marriage and success of his second, the death of his beloved parents—and an awful lot about his writing. First of all, I read it second, and so it had something to live up to that In Memory Yet Green didn’t. Finally, the book is less about Asimov’s struggles than his successes. Once the fight with Boston University is done and he is relieved of all but nominal duties so he can turn himself entirely to writing, the book becomes less about his life than about his writing. Fascinating though that is, and much though I enjoy learning it, and useful though the result is as a reference book— it isn’t quite as interesting. It is, however, interesting enough to be more than well worth while, and its being slightly less wonderful than In Memory Yet Green doesn’t mean it isn’t wonderful. Again, this is a book no Asimov fan should be without.